How to talk to anyone !!? This is tough question for anyone . Today communication skills are must for any working person . Some are shy to talk to unknown people because of poor language skills and low confidence. Some are just blabbermouths who cant control what they are saying,this creates a bad image . This book is answer to these question . 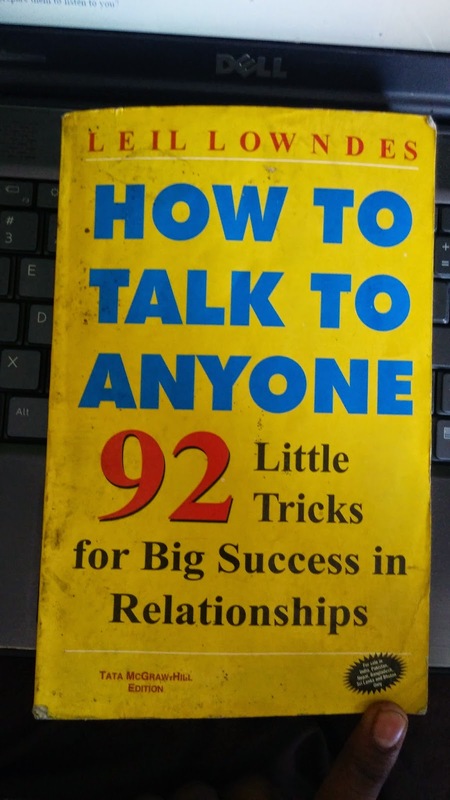 It has 92 little tricks for Big success in relationships . "Well ,here I am !" What difference does it make !! Read it slow and you shall know. Many times people look for conversation starters. They wish to talk but don't know how to approach or strike a conversation . 1. How to make someone feel like an Old Friend at Once? 2. How to not sound anxious? 3.How to start great small talk? 4. How to break into a Tight Crowd? 5. How to prepare them to listen to you? And How to Intrigue Everyone without saying a word !!? Go ahead read the book . This book is published by Tata McGraw-Hill so be assured of the quality content of this book . This book is must read for students,MBA grads,Business people ,people in Love ,party organizers anyone who wants to talk to unknown people .